The 'Rebel' can't create in the normal way because that creates new karma, so is - in effect - living off just one karmic 'breath' that is endlessly recycled. Energy (karma) can neither be created nor destroyed, say scientists, only transformed. Note, this is my conclusion, not Ken Carey's books. Ken Carey was a humble man living in the forest when he channeled a mind that claimed to be a god-like entity. But I'm suspicious of the high profile New Agers who support his writing. His books were published by HarperCollins, owned by Rupert Murdoch, who also published Icke's early New Age books. Last edited by edit; 24-12-2017 at 12:19 AM. These Chaotic Nodes are the result of multiple inter-locking phenomena. The reasons for the increased intensity of these inter-locking Chaotic Nodes is attributable to a combination of factors. Some of it is cosmic in its origins, some of it is due to randomness, and some of it is a result of manmade influences. Your collective experience of perceived time is accelerating at an unprecedented rate. And the “pressure waves” of this accelerated perception of time is due to the heightened pace of newly emerging technologies that you are becoming increasingly dependent upon. The increased pace of data you have to process is beyond your capability as a biological organism to cope with, and you are shifting—as a culture—to a technologically-based reality. As a result of this dependence upon technology you are entering a type of techno-servitude. And as with all new radical technologies there are good sides and bad sides to this reality. Were you a truly benevolent species, the acceleration of your technological culture could advance the quality of all life, but you are not collectively a benevolent species. And some of the newly emerging technologies that could enhance planetary life are being commandeered by forces that wish to control and enslave. At the same time there are benevolent forces also working with these new technologies to improve the quality of life. As a result of these opposing agendas, the future impact of technology upon Earth and your collective destiny is yet to be determined. Returning to the metaphor of the serpent shedding its old skin, how do you ride such a creature? How do you function in a world where multiple realities are in conflict with each other? How do you survive, intact, the accelerated pace of change, and who is it that will survive this—meaning what is your true nature? From one perspective what you are experiencing in your world is catastrophic in nature. From another perspective it is a highly potent evolutionary catalyst. In other words, the metamorphosis of your world could destroy you or propel you into higher states of consciousness. The choice, at an individual level, between personal destruction or an ascent into a higher dimensional reality is yours. The purpose of this message is not to address the planetary challenges facing humanity and other life forms that reside upon your Earth. Rather our focus is on what you can do, as an individual, in the midst of such intense challenges. The information in this message comes from the Aethos, the Tenth, Eleventh and Twelfth dimensions of our Hathorian reality. From the perspective of the Hathors who reside in the Aethos, your cosmos (as well as ours) is only one of many, and all of these innumerable “universes” as well as the beings who dwell within them, are all perceived as illusory dreamlike displays of holographic light. In other words, your reality, as well as ours, is fundamentally a temporary illusion brought about through holographic projections of light, transitory in nature, insubstantial and magical in nature. The beings who reside in the Aethos are our spiritual teachers, for they have transcended the illusory effects of projected holographic light that most beings perceive as reality. The Aethos has, instead, fully entered into the very ground of consciousness itself. You also possess this innate ground of consciousness, but it is obscured by your embodiment in time and space. Your nervous system is hard-wired into your five senses. This is a biological imperative and necessity for your physical survival, but the ground of your consciousness transcends all sensory phenomena. At the moment of your biological death you are faced with infinity, specifically the infinite nature of your own spacious awareness. In this message the Aethos is presenting a sound meditation and a method that allows you to make direct contact with your own spacious awareness and transcend the limitations of sensory-based reality as well as perceived time and space. We are dividing this message into two portions. In this message we are presenting the fundamental sound meditation and a basic method for making contact with your own spacious awareness—what we refer to as Spatial Cognizance. In the next message we will present a more harmonically complex sound meditation as well as explore some of the advanced applications of the method. As we said earlier, all technologies, regardless of their nature, are two-edged swords. They can be used in positive ways or in negative ways. Earlier, we were discussing this topic in relationship to the external technologies you are becoming increasingly dependent on. But now we are sharing an inner technology of consciousness. It is also a two-edged sword. The sole reason this method is being given is to empower you to transcend and transform the multiple realities you are facing. This is accomplished by temporarily removing the obstacles within your awareness to the spacious nature of your own consciousness. By making contact with the infinite reality of your own Mind (i.e., your transcendent nature), you can experience a type of freedom, contentment, bliss and happiness even in the midst of difficult and challenging situations. While some of you reading this may have already made contact with the ground of consciousness, most human beings are caught in the web of their sensory experience. When you make contact with your own spacious awareness, i.e., Spatial Cognizance, you are able to deal with difficult situations more effectively. This is because you do not identify yourself as being solely bound by any situation. Rather you reside in an expanded state of Mind in which you do not feel the pressure of sensory experience as you normally do. And because you possess an expanded state of awareness, you can affect situations with greater mastery. It is as if you are above the situation, rather than trapped in its web. This ability will serve you immeasurably as your world spirals into multiple Chaotic Nodes interlocking to create massive tsunamis of physical, mental, spiritual and planetary change. Dealing with yourself and your world from a more expanded state of awareness is the right use of Spatial Cognizance. But there is a danger in that some of you might use Spatial Cognizance as a means to escape the 3-D realities of your life. This is the other side of the sword metaphorically speaking. Indeed, from our perspective, more and more human beings are entering quasi-psychotic states of mind. Witness the increase of irrational destructive behavior all over the world. These harmful types of behavior are paradoxically a type of escape through the act of mindless ruination. Another kind of escapism is to reside in a bubble of quasi-contentment, happiness and bliss, paying no attention to anything or anyone else around you. This is not spiritual mastery; it is an escape into delusion. If, however, you make authentic contact with Spatial Cognizance and meet the changing realities of your world with this state of Mind, you will forge a transcendent transformational power that will benefit you in innumerable ways. The ground of consciousness, (i.e., Spatial Cognizance) is the deepest space within you and transcends all phenomena including the world you perceive through your senses. By its very nature Spatial Cognizance is imbued with the qualities of contentment, happiness and bliss. These are inherent and exist independently regardless of what might be happening in the sensory and/or mental/emotional realms of your existence. In other words, while you may be angry, sad or mired in other “negative” thoughts, emotions or situations, the ground of consciousness is unaffected by these. This is one reason Spatial Cognizance can be such an invaluable aid to you as you deal with the accelerating pace of change in your world. It is also spacious in nature (meaning it is infinite and unbounded like space itself), and it is self-aware. It is what might be called pure awareness—awareness being aware of itself. When you have fully entered into Spatial Cognizance, you are at peace and have a clear sense of being unbounded or unfettered by the situations around you. This is another invaluable quality of Spatial Cognizance (i.e., the ground of consciousness). For human beings, the most efficient way to enter Spatial Cognizance is through the spatial abilities of the right cerebral hemisphere. This part of your neurophysiology is a master of spatial perception and by leaning on this innate ability you will more easily enter into a direct experience of Spatial Cognizance. The Basic Spatial Cognizance Sound Meditation is 5:56 minutes in length. You can, as you wish, listen to it back-to-back multiple times especially as you more deeply explore its potentials. It is best to listen to this with stereo headphones or ear buds so that the sound patterns are your primary sensory input. Due to the fact that you are directing your attention to inner space during the meditation, do not listen to it in situations requiring alertness. The meditation should be the sole focus of your attention. Upon the first striking of the bowl, recall the feeling of a large space. It doesn’t matter what the space is so long as it feels large and spacious to you. It could be the top of a mountain, a large open area or any spacious environment of your choosing. The type of space you choose to work with is immaterial. What is important is that it feels large. As you continue to listen to the sounds, make sure you are feeling the sense of space. You are not visualizing space or thinking about it. You are re-creating the felt sense of being surrounded by a very large space. Visualizing or thinking about space will not activate the parts of your brain/mind that generate a direct experience of Spatial Cognizance. Only the felt sense of being surrounded by a large space will activate the neural pathways that will allow you to experience your own spacious nature. After you have generated the felt-sense of being surrounded by a large space, become aware of yourself being aware of the sense of spaciousness. This simple act of being aware that you are aware of spaciousness is the seed of immense insight and mastery. Do not be deceived by its everyday simplicity. Once you hold the felt sense of spaciousness while being aware that you are aware of space, you have entered the foyer, so to speak, into the vast mansion of Spatial Cognizance. There is one final yet crucial to step to this process—the addition of a highly coherent emotion such as appreciation or gratitude. Adding these emotional qualities will insure that you enter a higher dimension of Spatial Cognizance. In fact, appreciation or gratitude are the benchmarks of all higher dimensional realities that are benevolent in nature. For those of you who may have difficulty generating appreciation or gratitude spontaneously, consider this: your ability to be self-aware is one of the greatest gifts you possess. This seed of self-awareness travels with you when you die and allows you to experience the non-corporeal worlds. Regardless of what world you reincarnate in or even if you incarnate as an energy or sprit-being, your innate capacity to be self-aware travels with you. Thus, cultivating self-awareness and mastering it is a tremendous and indispensable boon to your self-realization. For those of you who are familiar with the art of psycho-navigation you can enhance your experience of spaciousness in this manner: imagine that you are not only surrounded by a large space but there is no boundary between your inner space and the outer space around you. In other words, the boundary setting mechanisms of your consciousness are temporarily suspended, allowing your awareness to expand into and identify with a much larger space than you are normally used to. This will activate the deeper potentials of your right hemisphere and its spatial capabilities. In a more advanced application of this principle you expand your sense of space to include the entire universe and all the worlds, as well as all the multitudinous dimensional realities that comprise your cosmos. Merging into spaciousness in this manner will, for most people, create the most profound shift in spatial perception. If you engage these expanded methods of accessing spaciousness it is important to return to your normal sense of identity after the meditation is complete. This is most easily accomplished by simply opening your eyes and engaging your peripheral nervous system. Gently rub your ear lobes, as the major meridians of of your body’s organ systems can be found within your ears as well as your feet. If you find it difficult to return to 3D reality after a deep exploration of spacious awareness, you could also rub your legs, arms and torso, which will stimulate your brain/mind complex to process external stimuli and return you to normal sensory reality. The sound meditation itself is designed to support your right hemisphere, to shift your focus of attention into a feeling of expanded space. In its simplest application you would simply sit with this meditation engaging the steps we have described so that it culminates in your being aware that you are aware of spaciousness conjoined with a sense of appreciation or gratitude. You could then, if you wish, work with it as solely as a sound meditation that you return to from time to time as a means to loosen your perception and begin the process of perceiving the ground of consciousness that transcends your sensory experience of the world. The ultimate purpose of this sound meditation is, however, to train your brain/mind to enter Spatial Cognizance at will. And then in your day-to-day life enter Spatial Cognizance without the use of the sound meditation. This simple act will eventually train your brain/mind to attend to two realities simultaneously—the reality of Spatial Cognizance (and the freedom of spacious awareness that it brings) along with the act of dealing with the realities of your 3-D existence. This will eventually give you greater mastery over the situations you confront in your life because you will not identify with the web of sensory-based reality. You will instead, identify with your ultimate nature (i.e. transcendent awareness). Your sense of Self will have expanded far beyond the confines of your personal identity to include the infinite spaciousness of the ground consciousness. This type of Spatial Cognizance both transcends and yet paradoxically includes your personal identity. With this greater range of self-awareness. you will better be able to meet the challenges of a rapidly changing world. And, at the moment of your death, you will more likely have developed the ability to decide where you wind up next—meaning what lifetime or what dimensional existence you reside in. This is one of the greatest gifts of the Aethos, and it is being offered to you as your world enters a most perilous passage. Regardless of what you sense occurring around you we encourage you to make contact with your own Spatial Cognizance, for it is a great ally, a transformer of destiny and brings with it a cornucopia of non-ordinary abilities that will benefit both you and your changing world. Last edited by edit; 30-12-2017 at 10:38 AM. But, the theory of holography is what is fascinating to me. ... Unlike a camera, which has only one point of light reference, a hologram has two or more points of light references . Propagation of de Broglie waves in 1d—real part of the complex amplitude is blue, imaginary part is green. The probability (shown as the colour opacity) of finding the particle at a given point x is spread out like a waveform; there is no definite position of the particle. 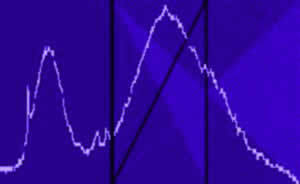 As the amplitude increases above zero the curvature decreases, so the amplitude decreases again, and vice versa—the result is an alternating amplitude: a wave. Top: Plane wave. Bottom: Wave packet. Last edited by edit; 01-01-2018 at 03:00 AM. In an episode of "American Dad" ("The Two Hundred"), a science experiment unexpectedly results in one character's various personas separating out into separate physical bodies. We humans are holographic fragments of the 'Rebel' who created our world out of itself in a desperate bid to escape from cause-and-effect (Karma), I believe. The Rebel's manifestation on Earth as holographic fragments is hinted at in channeled information and at the movies, e.g. "Multiplicity"; "Being John Malkovich"; "Attack Of The Clones". A similar, but more positive New Age view (where the 'Creator' is a 'good' Creator) is in the psychically channeled writings of KEN CAREY ("The Starseed Transmissions"), who is endorsed by New Age leading lights, e.g. JEAN HOUSTON, BARBARA MARX HUBBARD, LOUISE HAY, SIR GEORGE TREVELYAN, JOSE ARGUELLES. In the Walt Disney movie "Fantasia", the poet GOETHE's poem "The Sorcerer's Apprentice" is the basis for a sequence when a magic broom breaks up into smaller versions of itself (fractal). The apprentice is unable to stop the broom from fetching pails of water (and causing a flood), so chops the broom up, but the pieces just become smaller brooms that continue working. This story has its' origins at least with the 2nd century writer LUCIAN and his story "The Lover Of Lies". Lucian wrote arguably the earliest known story about a trip to the moon. Goethe wrote "Faust", in which the Devil makes a bet with God. Consequently, the Devil makes a pact with a human (Faust), in which the Devil acts like a Genie, giving Faust what he wants. The Rebel similarly wants to eliminate its karma to get what it wants. The holographic principle can be symbolised with MPD (Multiple Personality Disorder), which features in the sci-fi novel (and film version) "K-PAX", in which a mental patient with MPD (a.k.a. DID) claims to be an alien from a utopian planet where there is no government; no formal laws; a peaceful self-organizing anarchy. A split personality is a theme in the horror story of Jekyll and Hyde (good separated from evil). The holographic principle is seen in the ancient Indian myth of the net of the deity INDRA, which consists of connected jewels (or pearls) that reflect each other. Indra is described as a magician/illusionist and – like Saint George and others – he slays an 'evil' serpent/dragon. Slaying a dragon symbolises the elimination of karma, I conclude. Indra's net is used to trap his enemies. Our world/realm is also a trap, in that it is difficult to leave. A net captures a large amount of fish thanks to Jesus, who says that he will turn fishermen into "fishers of people". The Gnostics regarded our material world - especially human bodies- as a comic prison, which links to the notion of 'sinful flesh'. Indra's net hangs over his palace at the centre of the cosmos/world/universe, located on a mountain (Mount MERU). The centre of the cosmos/world equates with the 'eye' of the karmic storm where there is no karma. At the centre of the world – in some legends – are dragons/serpents/snakes, e.g. the serpent PYTHON who is slayed by the Greek God Apollo. Mount Meru features in Buddhism too, and is depicted at the centre of MANDALAS. A mandala represents the entire cosmos/universe. Meru has 5 peaks, corresponding with 5 Buddhas. There is a mandala of the "five Buddhas". The Buddha wants to escape karma. To illustrate the principle behind Indra's net, a Buddhist called FAZANG (FA-TSANG) devised a hall of mirrors with a statue of Buddha in the middle, whose image was replicated infinitely. A hall of mirrors features in the martial arts film starring BRUCE LEE: "Enter The Dragon" (1973), written by MICHAEL ALLIN, who also co-wrote the sci-fi movie "Flash Gordon" and who collaborated with Director NICOLAS ROEG ("The Man Who Fell To Earth" and "Don't Look Now"). Multiplicity is a commandment of the Biblical God who after his flood tells the surviving humans (Noah et al) to be "fruitful" and "multiply". On a smaller scale, all life forms begin as single cells that divide and multiply. We humans, writes Ken Carey, will become the 'brain cells' (so to speak) of a superorganism that will explore the universe, directed by the 'Creator'. Many versions of the comedian ROBIN WILLIAMS appear in the "Family Guy" episode "Family Guy Viewer Mail #2". Robin Williams appears in manifold forms after Peter Griffin's love of Williams magically results in everyone he touches turning into versions of Williams, a bit like the mythical King Midas whose touch magically turns everything and everyone to gold. But his wish is more of a curse, when food and people also transform to gold. Creating gold from base metals is a goal of Alchemy. This alchemical gold- I conclude- is symbolic of the quest for immortality, which is the Rebel's liberation from time and karma. Due to the predominance of graphical user interfaces, most modern applications feature a main loop. The get_next_message() routine is typically provided by the operating system, and blocks until a message is available. Thus, the loop is only entered when there is something to process.